Dr. James A. Vito is a highly trained and skilled dentist providing General, Cosmetic and Advanced Restorative dental services. Other services include Non Surgical and Surgical Periodontal care, Laser dentistry and the surgical placement and restoration of Dental Implants for his patients of the Philadelphia, Wayne and Main Line Area. All these procedures are available in Dr. Vito’s office with sedation also known as IV sedation, Sedation dentistry or sleep dentistry for the fearful and apprehensive patients. Making Dreams Come True with James A. Vito, D.M.D. Following his hospital residency, Dr. Vito was accepted into the prestigious Periodontal Prosthesis-Fixed Prosthodontics program at the University of Pennsylvania School of Dental Medicine, where he was trained and certified in two dental disciplines: Periodontics, the diagnosis and treatment of gum diseases and Prosthodontics, the diagnosis and treatment of decayed and/or missing teeth. Dr. Vito received his surgical and restorative training and certification in dental implants under the tutelage of world renowned implant dentist Dr. Carl Misch while attending the Misch International Implant Institute. He has three fellowships in Implant dentistry and is dual Board Certified in Implant Dentistry through The International Congress Of Oral Implantologists and The American Board Of Oral Implantology/Implant Dentistry. He is also a Master in Implant Prosthodontics through The International Congress Of Oral Implantologists. There are a limited number of dentists throughout the world so uniquely trained as Dr. James A. Vito. 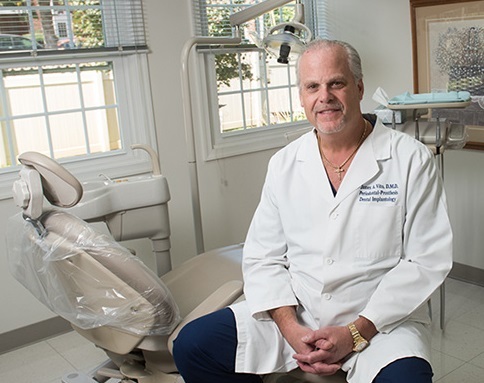 Dr. Vito is annually recognized as the “Best” by his peers and patients in the Main Line Today Magazine, Suburban Life Magazine, Philadelphia Magazine and Main Line Times and Suburban Times Newspapers for Prosthodontics, Cosmetic and Implant Dentistry. He is a former faculty member of the Misch International Implant Institute as well as a Clinical Associate Professor of Periodontics and Implant Dentistry at the Kornberg School of Dentistry, Temple University. Dr. Vito lectures locally and nationally on the surgical placement and restoration of dental implants. Dr. Vito maintains an active membership in the following professional organizations: The Academy of General Dentistry, the American Dental Association, the American Academy of Periodontics, the Academy of Osseointegration, the American Board of Oral Implantology/Implant Dentistry, The International Congress of Oral Implantologists, The Implant Prosthodontic Section of the ICOI and the Philadelphia Dental Society. In addition, he is a member of numerous local dental societies. Dr. Vito has been practicing General, Cosmetic, Advanced Reconstructive Dentistry (Full Mouth Rehabilitation), as well as Dental Implant, and Sedation Dentistry in the Philadelphia area since 1987. Today Dr. Vito treats a national and international clientele, successfully restoring their aesthetics, function, oral health and smiles one patient at a time.